New World porcupine is the common name for any of the large, stocky, largely arboreal and nocturnal rodents comprising the family Erethizontidae, characterized by a spiny covering of sharp, barbed quills. They live in the Americas, with most species in South America, but also species in Central and North America (Mertz 2004). Erethizontids are important part of terrestrial food chains, eating seeds, fruits, bark, and other vegetation and, despite their quills, serving as prey for such animals as the fisher (Martes pennanti; a particularly adept predator), mountain lion, great-horned owl, and bobcat. For humans, New World porcupines add to the wonder of nature with their unique morphology and behavior. New World porcupines share their appearance of a spiny covering with Old World porcupines (family Hystricidae) and both belong to the Hystricognathi branch of the vast order Rodentia. Apart from appearance, however, the two porcupine families are quite different, including the fact that the spines of the Old World porcupines lack the barbules characteristic of the New World porcupines. New World porcupines are characteristically arboreal (adapted to life in trees), whereas the Old World porcupines are usually terrestrial and normally do not climb trees (Atkins 2004; Mertz 2004). Two taxonomic families of rodents share the common name of porcupines, Erethizontidae, or New World porcupines, and the Hystricidae, or Old World porcupines. Both are characterized by heavy bodies with some areas covered with long quills or spines (modified hairs). The quills, which are interspersed with coarse hair, can detach from the skin easily when touched and become embedded in a potential predator. The animal's quills or spines take on various forms, depending on the species, but all are modified hairs coated with thick plates of keratin, and are embedded in the skin musculature. As rodents, both groups have incisor teeth that grow continuously throughout their lives and must be kept worn down by gnawing. The incisors have enamel on the outside and exposed dentine on the inside, so they self-sharpen during gnawing. Rodents lack canines and first premolars, which creates a space between their incisors and their grinding teeth. New World porcupines are stout animals, with blunt rounded heads, fleshy mobile snouts, and coats of thick cylindrical or flattened spines. They have relatively small eyes, and small and round ears, with the ears almost covered by hair (Mertz 2004). Their clawed, four-toed feet on short, strong limbs allow them to be excellent climbers (Mertz 2004). They vary in size from the relatively small prehensile-tailed porcupines, which are around 30 centimeters (11.8 inches) long, and weigh about 900 grams (2 pounds), to the much larger North American porcupine, which has a body length of 86 centimeters (33.8 inches), and weighs up to 18 kilograms (39.6 pounds)(Macdonald 1984). The most characteristic feature are the sharp quills (actually modified guard hairs), which cover much of their dorsal (back) surface, from the head to the tail, although a few species are naked on a portion of their tail (such as Coendou prehensilis and Sphiggurus mexicanus, both species with prehensile tails used in climbing) (Mertz 2004). While the spines are obvious in many species, such as Erethizon dorsatum (North American porcupine), they are hidden below the fur in other species and in most young porcupines of diverse species (Mertz 2004). The spines or quills of all the New World porcupines are barbed, unlike the barb-less quills and spines of the Old World porcupines (Atkins 2004). The quills face backward on the body, but can be raised erect when under duress, reaching up to ten centimeters (four inches) in the North American porcupine (Mertz 2004). Although the quills cannot be launched, they are easily detached and can impale an attacker, with the barb lodging in the attacker's body (Mertz 2004). New World porcupines range from Canada and Alaska in North America to northern Argentina and Uruguay in South America (Mertz 2004). The northernmost species is Erethizon dorsatum found in most of Canada and Alaska except the far north regions, and down to the northern edge of central Mexico, including most of the western half of the United States and the northeastern and north-central states (Mertz 2004). Most species of New World porcupines occur in South America (Mertz 2004). Many species of New World porcupines are arboreal, unlike the terrestrial Old World porcupines. 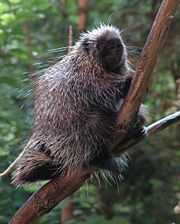 New World porcupines are primarily forest animals, found in deciduous and coniferous woods and rainforests (Mertz 2004). 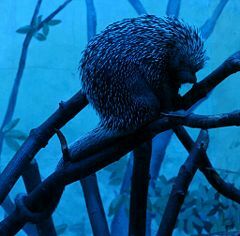 Although the habits of many New World porcupines are unknown, erethizontids are presumably all arboreal and nocturnal (Mertz 2004). However, they are less strictly nocturnal than Old World species in their habits, and while some types live entirely in trees, or spend days sleeping in trees, others have dens on the ground. Species like Sphiggurus mexicanus and Coendouprehensilis have long and powerful prehensile tails, which help them balance when they are in the tree tops. The erethizointid diet consists mainly of seeds, fruits (including nuts), bark, and leaves, including conifer needles, but they also are known to consume roots, stems, grasses, and flowers (Macdonald 2006; Mertz 2004). Some species also eat insects and small reptiles (Macdonald 2006). Despite their quills, porcupines are targets of such predators as the fisher or North American marten (Martes pennanti), bobcats, mountain lions, great horned owls, and coyote. The fisher is the only predator known to have a specialized killing technique, involving exhausting the porcupine and repeatedly biting and scratching at the face, and after it has died, flipping over the porcupine and eating from its unprotected belly. Porcupines are generally solitary, although they may share a winter den (Mertz 2004). Mertz (2004) notes that, while the reproductive biology of many erethiontids is poorly known, it appears that female porcupines generally are either pregnant or lactating for most of their life. Gestation is commonly around 200 days and soon after giving birth, the female mates again. Solitary offspring (or, rarely, twins) are born fully developed, with open eyes, and are able to climb trees within a few days of birth (Macdonald 1984). They are fed by the mother for two to three months, and generally reach adult size in about a year, and sexual maturity at 1.5 to 2.5 years of age (Mertz 2004). 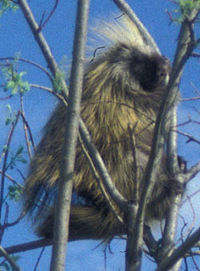 New World porcupines include four to five genera in three groups. The first group is represented by the North American Porcupine (Erethizon dorsatum), a stout, heavily built animal, with long hairs almost hiding its spines, four front- and five hind-toes, and a short, stumpy tail. It is a native of the greater part of Canada and the United States. E. dorsatum is the only extant member of its genus. The second group includes the three genera of Coendou, Sphiggurus, and Echinoprocta and contains about 14 to 17 species, depending on the taxonomic scheme. They are of a lighter build than E. dorsatum with short, close, many-colored spines, often mixed with hairs. The hind-feet have only four toes, owing to the suppression of the first, in place of which they have a fleshy pad on the inner side of the foot; between this pad and the toes, branches and other objects can be firmly grasped as with a hand. E. rufescens is the only extant representative of Echinoprocta. Coendou has about 11 species, with three new species described since 1992, including two (Coendou ichillus and Coendou roosmalenorum) described as new species in 2001 (Mertz 2004). However, in some taxonomic schemes certain of the 11 Coendou species are instead classified in the Spiggurus genus and others identified as the same species as one listed in Spiggurus (Mertz 2004). Spiggurus has five extant species, depending on the taxonomy, with S. mexicanus sometimes classified under the genus Coendou (Mertz 2004). Genus Chaetomys is distinguished by the shape of its skull and the greater complexity of its teeth. It contains one extant species, C. subspinosus, a native of the hottest parts of Brazil. This animal is often considered a member of the Echimyidae on the basis of its premolars. It was considered to be extinct until rediscovered in 1986 (Mertz 2004). The following are species as identified by Mertz (2004); however, other taxonomic schemes place many of the species of Coendou in the Sphiggurus genus, and S. mexicanus as C. mexicanus. Atkins, W. A. 2004. Old World porcupines (Hystricidae). Pages 351 to 364 in B. Grzimek et al., Grzimek's Animal Life Encyclopedia, 2nd ed., vol. 16, mammals V. Detroit, MI: Thomson/Gale. ISBN 0787657921. Macdonald, D. W., ed. 1984. The Encyclopedia of Mammals. New York: Facts on File. ISBN 0871968711. Macdonald, D. W. 2006. The Encyclopedia of Mammals. Oxford: Oxford University Press. ISBN 0199206082. Mertz, L. A. 2004. New World porcupines (Erethizontidae). Pages 365 to 375 in B. Grzimek et al., Grzimek's Animal Life Encyclopedia, 2nd ed., vol. 16, mammals V. Detroit, MI: Thomson/Gale. ISBN 0787657921. History of "New World porcupine"
This page was last modified on 14 September 2008, at 15:32.